Players wear all kinds of outfits during their pre-draft interviews with teams. Some wear college polos. Others wear casual attire. Some wear suits. Nick Mullens falls into the latter category. This should not be surprising, considering the various tales we have heard throughout the past week depicting Mullens as a football junkie who prepares the right way. 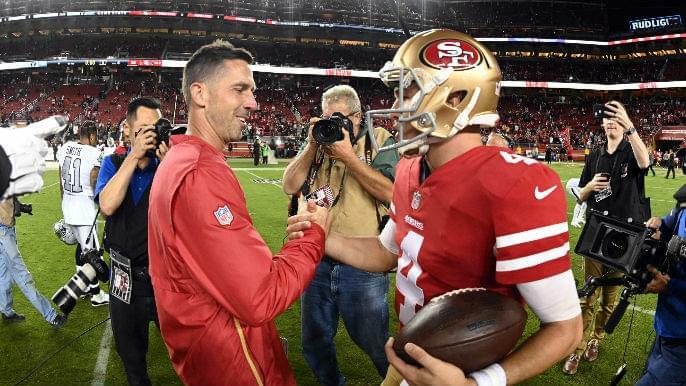 49ers head coach Kyle Shanahan said it is not uncommon for a player to sport a suit in these interviews, but he had some jokes as he reflected upon meeting Mullens. 49ers quarterbacks coach Rich Scangarello had informed the coaching staff of his interest in Mullens, a Southern Mississippi product who was not expected to be drafted. After Shanahan learned more about Mullens, then met him during the interview process, he came away impressed. The purpose of these interviews is to get to know the player and understand how he thinks, Shanahan says. He may test a player by showing him a play and asking him to outline it later in the interview. But Shanahan does not have a set format for the process. “If I have doubts with them, I’ll try to eventually expose them and just see where it goes,” Shanahan said. Mullens aced the interview, then signed a two-year deal with the 49ers after going undrafted. He has spent the vast majority of his two seasons with the 49ers as their practice squad quarterback. When Jimmy Garoppolo tore his ACL in Week 3, however, Mullens was promoted to backup. And when C.J. Beathard hurt his right wrist in Week 8, hampering him for Week 9, Mullens got the start. Mullens led the 49ers to their biggest win in more than four years when they drubbed the visiting Oakland Raiders, 34-3, last Thursday. He completed 16 of 22 passes for 262 yards and three touchdowns. He did not turn the ball over. Mullens’ near-perfect NFL debut earned him the starting job in Week 10, a decision that was not publicly announced until Mullens did so himself at his locker Tuesday. It turns out there was not much to consider on Shanahan’s behalf.